I’m a little late in posting the details of our Montreal-Girona Sketch Swap, but better late than never! The germ of the idea comes from Mark Liebowitz, New York City urban sketcher and organizer extraordinaire. Here’s how sketch swap works: on a mutually agreed upon date, sketchers from the two cities go out and sketch something that is iconic from their surroundings. They are paired with a buddy from the other city and when the sketches are done, each one sends out their sketch, hopefully around the same time. In Montreal, our sketches were done in February (see what I mean about late in posting this?) so we sketched lots of snow. Dogs in snow, wheelbarrows in snow, cemeteries in snow, snow-covered farm houses and trees. And in return we received beautiful scenes of Girona, Spain. Blue skies, palm trees, colourful houses on the Onyur River. It’s a bit like getting a letter from a pen pal but even better because there’s a sketch inside the envelope! Here’s a sampling of the sketches. The ones on the left side are sketched in Montreal. Can you tell? Chi Mai Vo sent her bagel factory sketch to David Pradas in Girona. Minerva Ferrel sent her sketch to Gemma Romero. Marc Taro Holmes exchanged sketches with Tony Xifre. 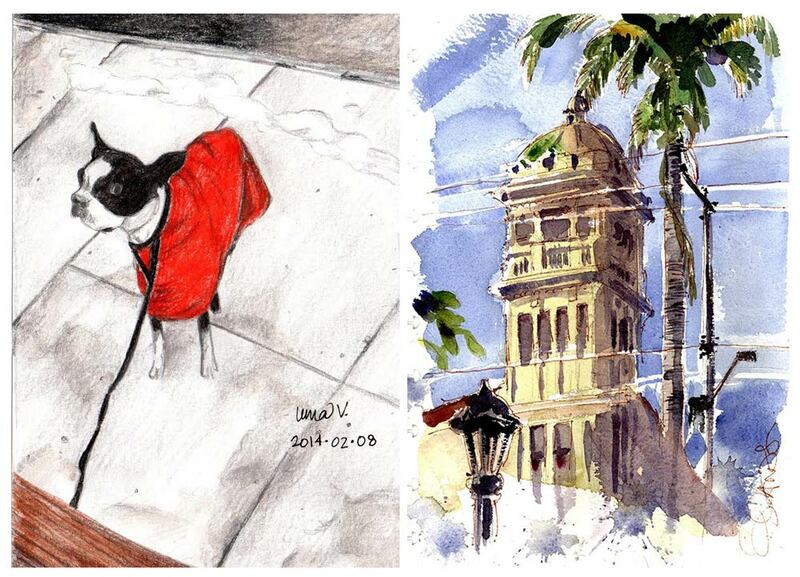 Uma Viswanathan and Beto Candia from Sao Paolo were sketch swap partners. Not sure how the cities got mixed up on this one! Shari Blaukopf sketched the wheelbarrow and Antoni Casas painted Cala S’Alguer. Marc Taro Holmes sent his snow angels to Murilo Romeiro in Sao Paolo. 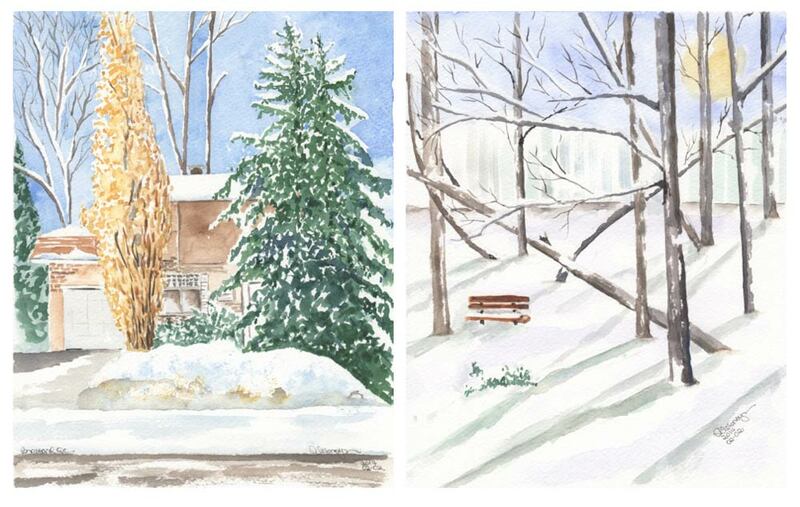 Jane Hannah and Gail Ishmael also sent out their beautiful snow scenes to sketchers in Girona (above) as did Danielle Desnoyers (below). We missed you the other day Suzanne! Hope to see you in May. How fantastic!! Love them all!! I agree Mary! I hope other cities do this too! What a splendid idea. Just as exciting as receiving a letter! Even better than a letter!! OMG what an awesome idea!